Are you on the hunt for excellent poke cake recipes? You’re in luck! poke cakes are some of our favorite desserts. 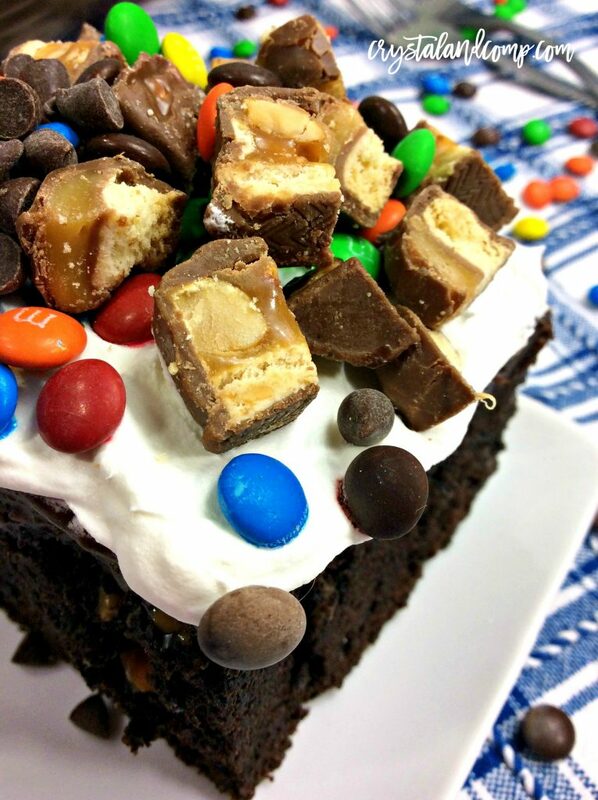 This is the most ultimate poke cake… it is drenched in fudge sauce and melted peanut butter. Then topped with some of our favorite chocolate candies! The icing is store bought whipped topping. Super easy and the perfect crowd pleaser. 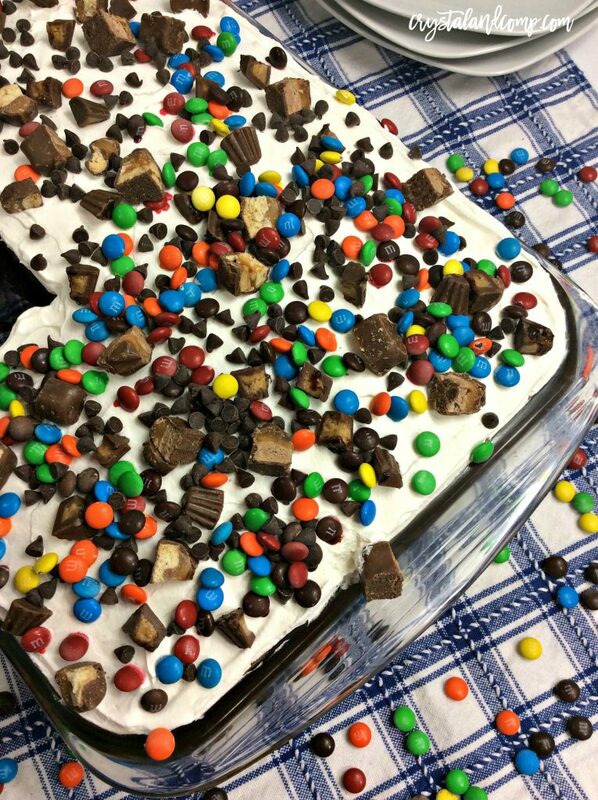 You can even make this for a birthday party! Let me show you just how easy this is to create. Gather up everything you will need. Grease your 13×9 cake pan with cooking spray or softened butter. Meanwhile, prepare the boxed cake mix according to package directions. Pour the batter into the greased baking pan and bake according to the box directions. Once it’s done let the cake cool 100%. Now, you can use the handle of a wooden spoon to poke holes in the baked cake. Next go ahead and heat up the peanut butter in a microwave safe bowl. Let it melt. Pour the melted peanut butter over the holes. Now it is time for the fudge. Pour the hot fudge over the holes. Now you can spread the thawed whipped topping on top of the cake. We used Cool Whip. Chop up the candies you want to use. If they are bars chop them up. Evenly distribute all of the candy pieces over the whipped topping. 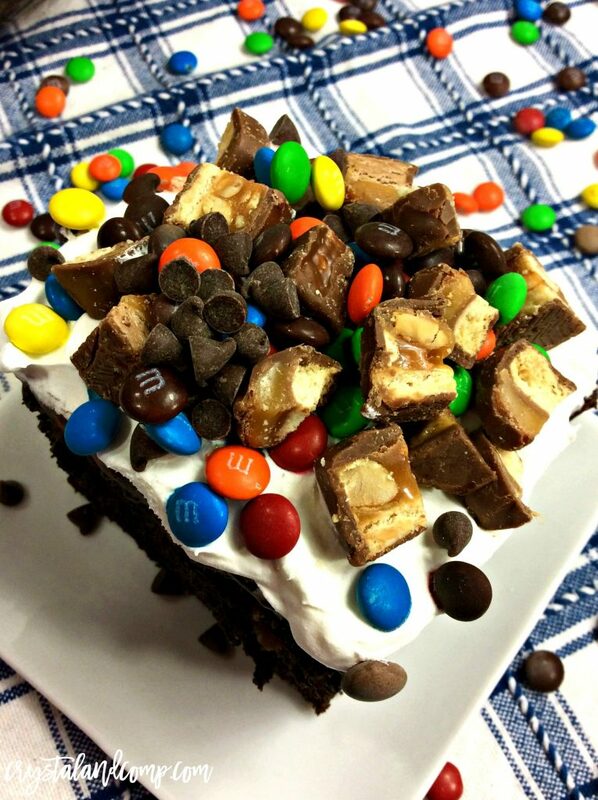 We used chocolate chips, snickers bars, m&ms, and mini peanut butter cups. It was perfect!! The cake is best if you refrigerate it for overnight. Slice it up and devour!